Welcome to the beautiful and majestic Topsail Island, North Carolina, with 26 miles of sun, sand, and surf. Topsail is located midway between Wilmington, NC, and Jacksonville, NC, and is easily accessible via a modern high-rise bridge spanning the Intracoastal Waterway at North Topsail Beach. As you approach Topsail Island from the top of the bridge, you will become mesmerized by the views of the natural salt marshes with the sparkling Atlantic Ocean as a backdrop. 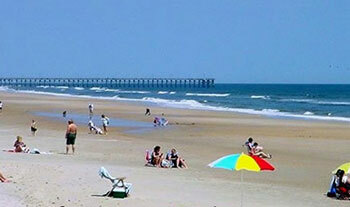 Topsail Island is considered one of the most sought after vacation destinations out of all the North Carolina beaches. For a relaxing Topsail Island vacation, please preview our large selection of Topsail Vacation Rentals including North Carolina beach rentals on the oceanfront. You will find a variety of luxurious single family homes with pools and oceanfront resort condominiums with pools and tennis courts. These include St. Regis Resort, Shipwatch Villas and Townhomes, Topsail Dunes, Topsail Reef, and Villa Capriani, as well as a large selection of duplexes, townhomes, and quadplexes sitting directly on the Atlantic Ocean. As you preview these Topsail Island rental properties, you can be assured they meet or exceed the high standards as required by Coastline Realty in order to qualify to be a part of our North Carolina vacation rental program. If you have any questions about any of our North Carolina Vacation Rentals, please give one of our friendly reservationists a call, as you will always be greeted with that world famous southern hospitality. So sit back, relax, and enjoy the show. I'm sure you will be able to find from our large selection of NC beach rentals, the perfect Topsail Island Vacation home for you and your family. We look forward to including you in our family of happy Topsail Island Vacationers. We'll see you at the beach!